Stand-up	Chris on	It would create the largest free trade bloc in the world. A free-trade agreement between the European Union and the United States could create 2 million jobs. But the negotiations are full of devilish details that could derail the process. Chris off	There remain stubborn sticking points for a free trade agreement, or FTA, especially the non-tariff barriers like import rules and regulations, intellectual property and environmental concerns. The EPP Group's Daniel Caspary is a member of the European Parliament's international trade committee. We have to talk about non-tariff barriers – different standards, different qualities, different regulations on both sides of the Atlantic, that's a big issue. But on the other hand, we shouldn't underestimate the question of tariffs – having an average tariff of 3 percent, that's about 20 billion euros a year. Chris off	Agricultural subsidies are a major obstacle to the talks, as both the EU and the US have continued to support their farmers against foreign competition. Those negotiations shouldn't be about subsidies, we should be about better market access for our European farmers in the American market and vice versa. Chris off	Consumer protection is also a concern, and MEPs intend to ensure that is not compromised. The European Parliament's approval is necessary to put an FTA into force, and has asked the European Commission to keep it informed. 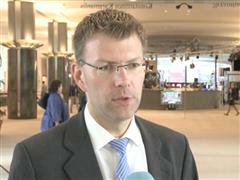 Daniel Caspary, German MEP, on	I see big concerns among some consumers, about what such an agreement may bring to them. But on the other hand, I think we should see those issues relaxed. Yes, we're having different standards, but also in the United States, there aren't millions of American dying every year because of bad consumer protection standards. They are different. We should make sure that they fit together. We should clearly assess which standards are reasonable and why. So when are we going to have this FTA? I would be happy if our negotiators were to find an agreement by the end of 2014, that's a good date. Until then, the European Commission is in power. Until then President Obama will be in a strong position in the United States. Chris on	The divisions are sometimes deep among national interests, sectoral interests and political interests. Bridging those differences will take a great deal of political will, with the carrot being stronger growth for both sides of the Atlantic. Find out more about the activities of the largest political force in parliament by checking eppgroup.eu. Thanks for watching and see you again soon. Description	An EU-US Free Trade Agreement could generate millions of jobs a year, if both sides find the political will to overcome the obstacles, says EPP Group MEP Daniel Caspary. Sticking points include subsidies and non-tariff barriers. The European Parliament also aims to maintain consumer and environmental protection.